Over breakfast at the Maison Luc Bed and Breakfast in Kaiteriteri, a small town of about 750 people along the northern tip of South Island, my hosts suggested that I take a taxi to Abel Tasman National Park rather than drive. New Zealand’s smallest and only coastal national park is accessible by car, but only to the entrances—no roads infiltrate it. As an alternative, the thought of hopping on a water taxi intrigued me, and any chance to be on the pristine waters in and around this country was always an appealing one. Silver ferns on display at Abel Tasman National Park. From the pickup dock at Kaiteriteri Beach about a mile from my B&B, we sailed north past Split Apple Rock, a large granite boulder naturally cleaved right down the center, and some lazy fur seals basking in the sun. I stepped off the taxi at Bark Bay, planning to rendezvous with it later in the day at a different location. After I watched the taxi speed away, and the only two other people who disembarked with me make themselves comfortable right there on the beach, I turned inland. The dense forest immediately swallowed me up as I began my six-mile hike, and, despite the popularity of this park and the particular trail I had chosen, I was very much by myself for the next five hours. 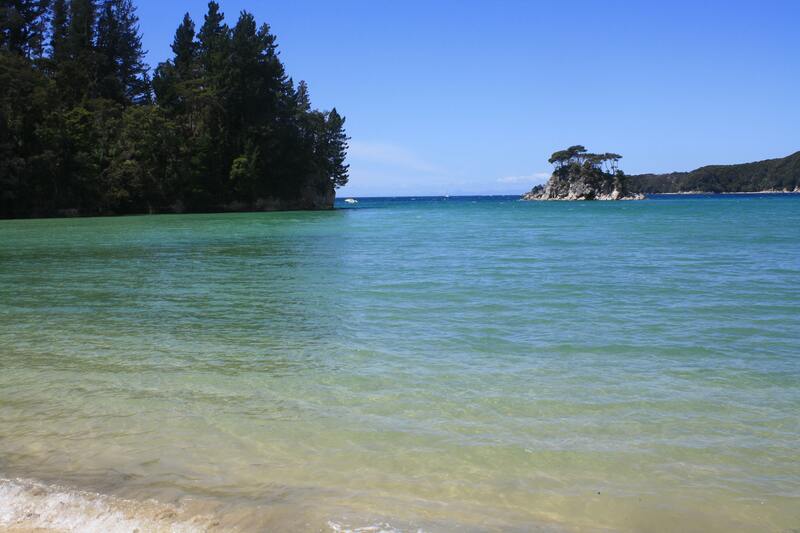 Named after the first European explorer to sight New Zealand, in 1642, Abel Tasman National Park was established exactly 300 years later and spreads out over 55,000 acres. Just about everything one goes to New Zealand to experience can be found tucked into this preserved area: exotic birdlife, golden beaches, turquoise water, and endless photogenic views of one of the world’s prettiest countries. 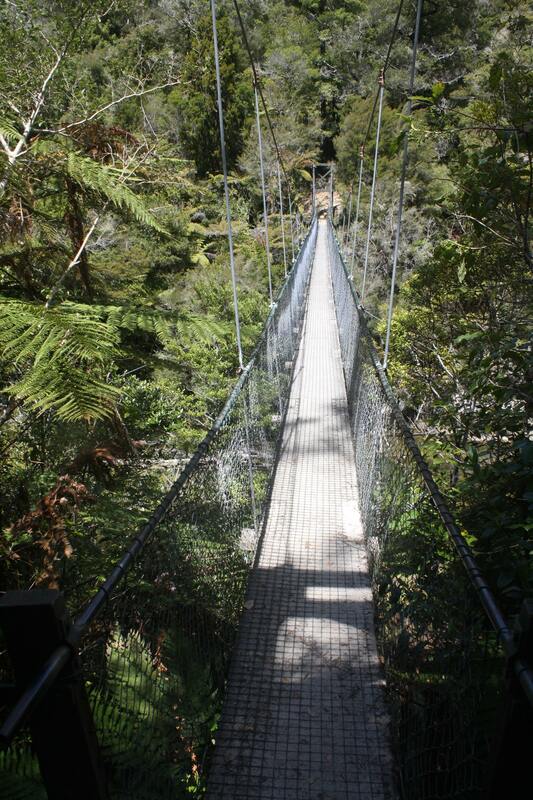 A wobbly suspension bridge leads hikers over Falls River. The intermediate Abel Tasman Coast Track runs 37 miles through the park, with huts and campsites along the way for anyone embarking on multi-day hikes. The twisting section on which I was now trekking offered flawless views of Bark, Sandfly, Frenchman, Boundary, and Torrent bays as it rose and dipped along the coast. As I acclimated myself to my lush surroundings, being serenaded by the occasional call of a New Zealand bellbird and enjoying a gentle cool breeze floating off the water in between the trunks and branches of the beech trees, I inspected the prevalent silver ferns all around me (green on one side of the frond, silver on the underside). The country’s national symbol appears on everything, from New Zealand’s coat of arms to its professional rugby teams. 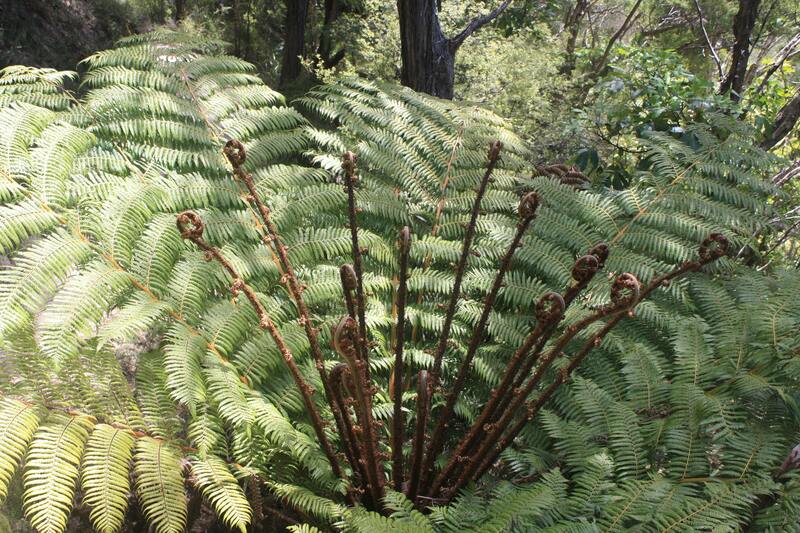 Tightly curled brown spirals of unfurled ferns popped up along either side of the trail; those that had uncurled themselves like enormous fans provided a shimmering green canopy above me. I continued this enchanting walk in the woods until I was greeted by a 154-foot suspension bridge that could very well mean the end of the road for the pusillanimous. My first step onto the passage revealed just how bouncy this link was, but my nerves steeled by the time I reached the center and took in the peaceful Falls River sliding by beneath me. I began my first real descent on the trail down to the beach at Torrent Bay, where I enjoyed a light packed lunch under a tree, watching an occasional canoe or sailboat glide by on the shockingly clear water. Refueled, I strolled past a few of the private homes here in the park and some flamboyant pink rhododendrons before delving back into the forest and uphill again. The beach at Torrent Bay invites you to forget the existence of man. The trail continues past pools, streams, and estuaries. I spied a traffic jam of half a dozen temporarily abandoned kayaks, wondering where the owners had wandered off to in this pristine wilderness. I arrived at my final destination, the soft beige sands of the beach at the Anchorage, enthralled by what I had seen. Spring had not fully arrived yet, so the water was still too cold for a swim, but it was perfect enough to dip my feet in and watch a couple of black oyster catchers with orange beaks play tag with the ebb and flow of the gentle tide. Waiting for a taxi had never been so pleasant.